Skateboard bearings are the most complicated and least durable part of the skateboard. They take a lot of abuse and most aren’t really suited to the forces of skateboarding. You can get them to last longer by following my advice. 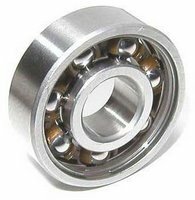 The wheel bearings used for skateboarding were originally designed for use in machines. They are only designed to spin mechanical devices. Throwing them into skateboard wheels has been a good solution but they don’t take well to the side to side bashing that skateboarding causes. Skateboard bearings are exposed a lot of impacts, side to side shock, dirt and moisture. Not exactly a safe environment for machine parts. Some companies claim high quality by quoting high ABEC ratings. ABEC means nothing for skateboarding. This does not stop marketers’ from slapping high ABEC ratings and passing them off as good bearings. What makes a bearing good for skateboarding is good lateral or side to side strength, protection from dirt and ease of cleaning. Their are companies that have done a good job at making skateboard bearings that can handle the dirt. Creating removable covers, nylon cages and other products to make it easier to clean them. They also create deeper races for the balls to fit into for more lateral strength. They skate rate their bearings rather than giving them an ABEC. I use the Bones Reds because they are a good price and I can maintain them. They have a removable shield and nylon retainer. This makes them durable enough to be taken apart and put back together. These features matched with a price that is lower than most other skateboard bearings give Bones Reds the edge for me. 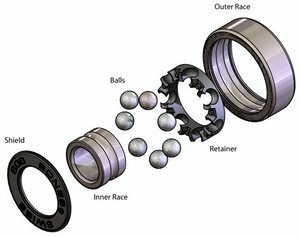 This is an exploded view of what the Bones bearings are made out of. I grabbed this from the Bones website. They have an excellent description of their bearings and describe in more detail some of the stuff I talk about here. I will tell you how to maintain your skateboard bearings here. Other than the deck itself this is the most common thing that needs replacing on a skateboard. Skateboarding on the streets and doing street tricks is just really though on the wheel bearings. To maintain your bearings you will need a few tools and supplies. It isn't that environmentally friendly to do this. It is better than buying a whole new set and just throwing out the old stuff. If at all possible try and be neat and tidy when you follow any of these steps. A place where you can make a mess. It stinks when you use cleaner so have good air circulation. de greaser or WD-40 for cleaning. Wipe down the axle and the washers. Take the wheel and place the bearing on the end of the axle. About 10mm(1/2”) in. You want to use the threads of the axle to grip the inner part of the bearing. Gently twist the wheel away from the hanger to get the threads locked. Do not pull away yet. Be careful not to spin the wheel either. Once the threads have a grip twist harder and the bearing should start to pop out. Pull gently until it comes out. Repeat for all other bearings. To clean the bearings you may only need to wipe them down. If they are smooth rolling then don’t both doing any more to them. If they don’t roll well then they may need a cleaning. If they spin really fast and sound dry then skip the cleaning and go lubricate them. Take the covers off with a pin if you have the kind that come off. Spray a bunch of the cleaner or WD-40(which is a cleaner, not a lube) into the crack of the bearing until it is full. Spin it around a bit and get the gunk out. Keep going until it is relatively clean. You don’t need to go crazy just get it pretty clean. Dry the bearings soon after you are satisfied. The cleaner may cause them to rust a small bit if you don’t. Place a drop of your lube on the inner or outer chase of the bearing. Spin the bearing a few times to work the lube into the chase. Place the bearing shield back on. Wipe the bearing down once more. Place the bearing into the wheel with the shield facing out. Put the wheel and bearing onto the axle of your truck and use it to push the bearing down into the wheel. I always do the side of the wheel that I want to face out first. That way I just push the second bearing in and I am done. Place the washer on the hanger. Place the spacer inside the wheel and then repeat with the other bearing. Place the last washer on. Tighten the wheel back on until it doesn't spin anymore careful not to over tighten. Then loosen them back until the is just a little play. Now that the bearings have been cleaned watch out for a little bit of lube leaking out after your skate for a bit. Wipe them down and you are good to go. With bearings, you can spend a lot if you want. 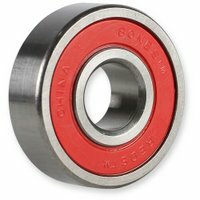 If you don't want to you can get great bearings for a pretty low price. Since they don't last that long I don't buy the really expensive ones. I stick with the reds and am usually pretty happy.